Info "Use the spoon to get the powder in the container! As long as you get a little in, it’s fine." Sprinkler System is one of Dribble and Spitz's Microgames in WarioWare: Smooth Moves. The player has to get some stuff into the receptacle by catching it with the spoon and tilting it in. Only one particle is needed. 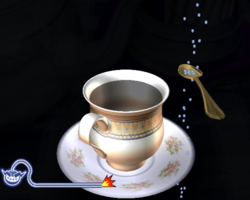 1st level difficulty: The player has to put sugar into a cup of tea. 2nd level difficulty: The player has to put fish food into a fish bowl. 3rd level difficulty: The player has to put stuff into a beer bottle.